In a small bowl add warm water and sprinkle the yeast over the top. Let the yeast bloom for 5-10 minutes until it becomes foamy. While the yeast is blooming, combine the flour, salt, rosemary and garlic in a large mixing bowl outfitted with a hook attachment. With the mixer on low, pour in the Vines & Branches Tuscan Herb Olive Oil until combined. Next, slowly pour in the yeast/water until the dough starts to come together. Turn the mixer onto medium once the dough starts to form and knead until smooth. Cover the bowl with plastic wrap and place in a warm, dark place to rise for 1- 1 ½ hours. Preheat oven to 450 degrees. On a piece of parchment, sprinkle heavily with cornmeal. Using hands, press dough out until very thin and even. In a small dish, whisk together Dijon and honey until smooth and spread evenly over dough as a sauce. 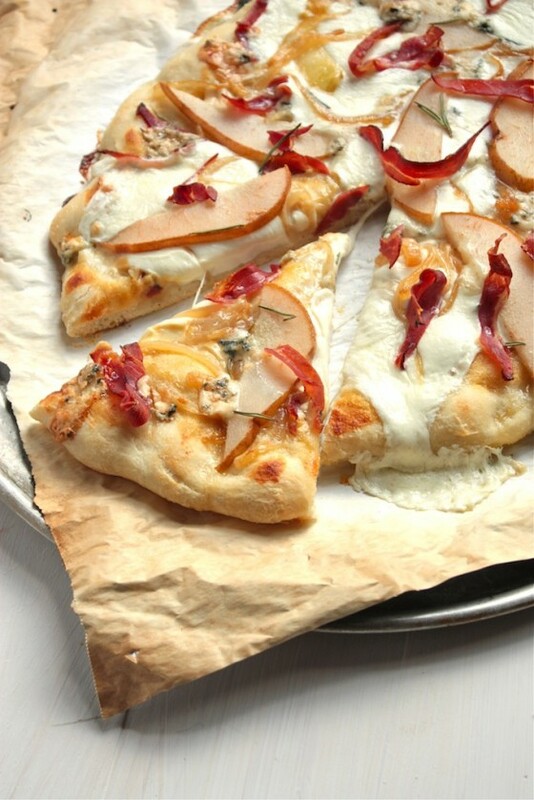 Top with remaining ingredients, mozzarella cheese, thinly sliced pear, caramelized onion, prosciutto, and gorgonzola cheese. Pull the parchment paper and pizza onto a baking sheet and bake for 11-12 minutes or until the crust is golden brown and cheese is bubbly and browning. Remove from oven and let rest 2-3 minutes before slicing. Serve immediately.